Graphs are a set of objects where some pairs of objects called nodes or verticies are connected by links called edges. The nodes here can be seen numbered from 1 to 6. There are edges connecting these various nodes. 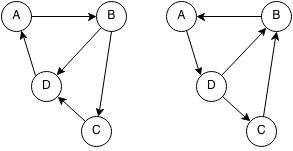 A undirected graph is a graph where an edge from A to B is the same as the edge from B to A for all edges. The above graph is undirected. A directed or bidirectional graph is a graph where edges have direction meaning if there is an edge from A to B then there may not be an edge from B to A. 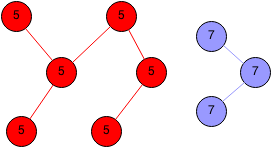 A subgraph is a subset of edges and vertices within a graph. 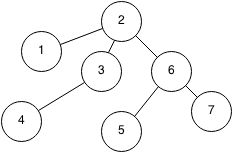 A directed acyclic graph (DAG) is a graph with no directed cycles (see topological sorting). A weighted graph is a graph that contains weights or values assigned to each edge or node. Usually these weights act as the cost to reach/use that node. 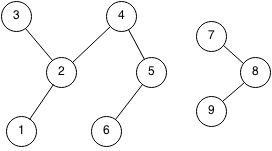 A spanning tree of a graph is a connected tree that spans all the nodes of the graph. A cycle occurs when you start at a node and you can reach the same node from a path. Note that trees cannot contain cycles. 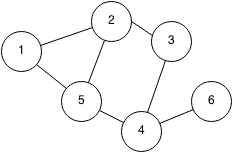 A cycle can be detected using a depth first search on each unvisited node to check if the DFS tree has a backwards edge. A topological sort or topological order of a directed graph is an order in which every node will come after its ancestors. All other nodes can visit that node. In other words, all nodes in a strongly connected graph can visit each other. To determine if a graph is strongly connected, we first pick a node and check that we can reach all nodes from it and this checks the first property. To check the second property, we can reverse all the edges of a node (A->B becomes B->A) and then check again that we can reach all nodes from the same node. 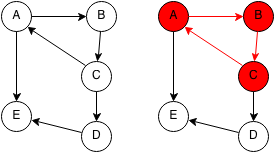 A connected component is a subgraph where all the vertices in the subgraph connect to each other. Finding the number of distinct connected components can be done using a breadth first search or a depth first search. A strongly connected component is a connected component but has the property that each vertex can visit any other vertex in the strongly connected component from any path.